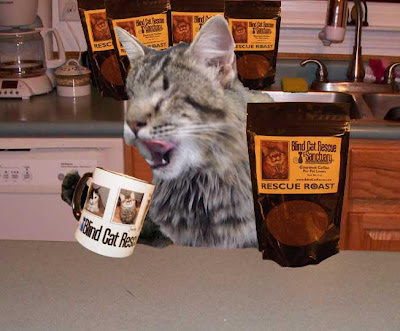 Cherry City Kitties : Rescue Roast Giveaway! Pawsome giveaway!! We did 3 of the "extras" which was easy 'cause we're already following you and BCR&S on Facebook. Mom has no idea how to link back! We visited the BCR&S too! I love that Blind Cat Rescue! you guyz gets an extra vote cauze you are poetry-ists and its your GOTCHA DAY ! Rock on, Peace out! We have to agree with Brian, we love that blind rescue. This sounds like a great thing to do but we don't drink coffee so don't enter us. Take care. We LOVE Blind Cat Rescue. 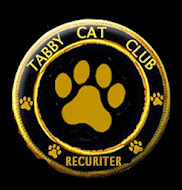 Did you know that we're supporting them as part of the Cat Ruler of the World Campaign for a Cause Contest? In fact, we have a VERY special post planned for this Thursday that will be all about them. Glogirly isn't a coffee drinker, so you don't have to enter us in the giveaway. Good luck to all the entrants!!! This is a great idea! Blind Cat Rescue is awesome! I agree with Brian--the Blind cat rescue is a wonderful idea! What a lovely idea! Wish we had these things in Malaysia too. What a great giveaway! We wish we could LOVE Blind Cat Rescue on FB, but we did LIKE them! And we like you guys too!! What a nice thing to do for a wonderful cause! Blind Cat Rescue does such good work. We aren't coffee drinkers either, so please don't enter us. It's good to hear that the essences seem to be helping Dex's paws! A big paws up for you, Dexter. Purrs.